Doctor recommended adult bed wetting alarm to stop nighttime bed wetting; also, recommended for children, teens and deep sleepers. Adult bed wetting alarm comes with two washable and reusable sleeves for added comfort, motivational reward system for children/teens and a bedside stand. Your product is valuable. Protect it. Care Protection & Coverage Plan doubles the warranty on your alarm and sensor. Protect your investment from occasional accidents like drops, falls and liquid damage. We will send you a just-like-new alarm and sensor to replace your damaged device. No additional hidden fees or service charges. Coverage plan must be purchased at the time the alarm is purchased. 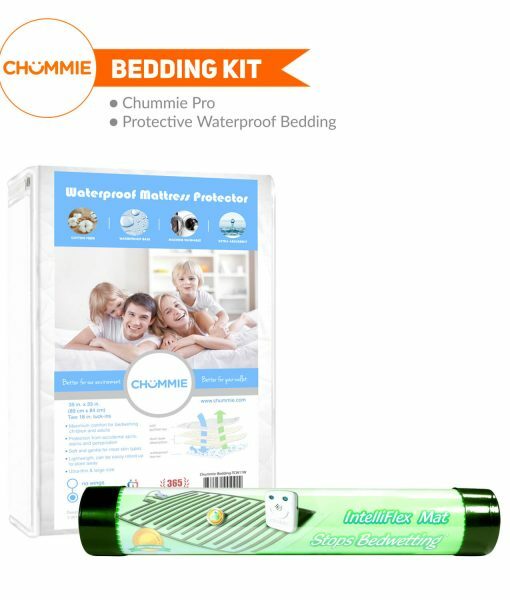 Chummie Pro adult bed wetting alarm is a preferred bed-side bed wetting solution for adults. This bed wetting alarm can also be used by children, teens and special needs individuals who do not want to connect any wires on their body or attach sensors on the underwear. It delivers fast results without comprising comfort. Simply program the adult bed wetting alarm with the 3-in-1 switch. Put the mat in the sleeve (already included) then place it under a cotton sheet and connect it to the alarm that resides on your bedside with 10 foot long cord for a comfortable natural sleep. The microprocessor controlled alarm is smart and will alert you on detecting low battery or if mat is accidentally disconnected at night so you never miss a bed wetting event! 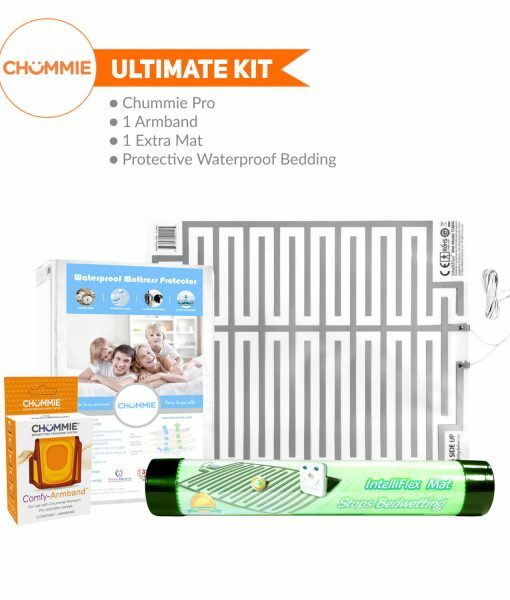 Chummie Pro alarms revolutionary technology and easy 30 second set up offers an effective and comfortable solution to stop bed wetting. Chummie Pro adult bed wetting alarm follows three steps: detect, alert and train. The mat uses 20 pairs of urine sensing strips to offer a larger urine detection area. It detects the 1st drop of urine and triggers the alarm to alert the bedwetter with loud beeps, strong vibration and two bright lights. Over time, Chummie trains the bedwetter to wake sooner and sooner, finally ‘beating the alarm’, and learning to stay dry through the night. Access the FREE Chummie Smartphone App from any mobile phone or tablet to get help, special offers, watch instructional videos, read FAQs, and contact support team with a click. Use it tonight box contains: bedwetting alarm unit, Intelliflex mat, 1 sleeve, bed-side stand, snap-on clip, progress chart, user manual, 2 AAA batteries. achievement certificate & registration card. Place the IntelliFlex bed mat under a dry cotton sheet and connect it to the Chummie Pro bed-side Bedwetting Alarm with the 10-feet-long cord. Our patent pending technology allows the bed mat to detect the first drop of urine. 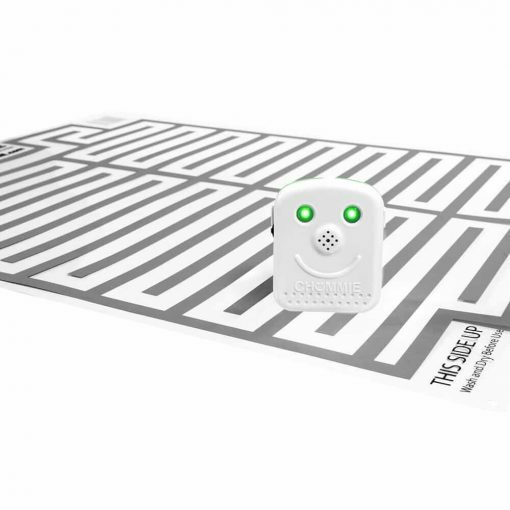 Upon detection the bed mat triggers the alarm that beeps with loud sounds, bright lights and strong vibration to ensure the user wakes up sooner. In few weeks, your child wakes sooner and sooner, finally beating the alarm, and achieving dryness. No more soiled sheets; just dry nights ahead. 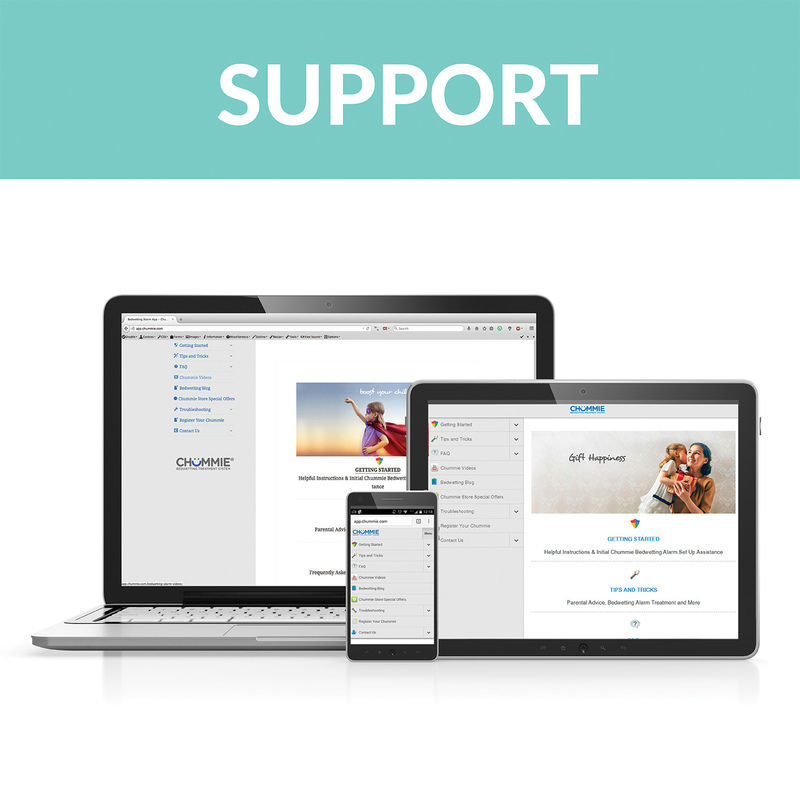 Access tips and tricks, FAQ’s, troubleshooting help, online support videos, or contact our dedicated support team from your phone or tablet. Manufacturer Theos Medical Systems, Inc.
Alarm Special Instructions As per instructions, wash the bed mat after every bedwetting accident. Good to have a spare bed mat to restart immediate treatment at night. What is the correct way to put the mat on the bed? Place the Chummie bedwetting alarm unit on the bedside or someplace convenient where your child can hear the alarm and reach it to turn it off. Secure the IntelliFlex mat on the bed by placing 4 pins in the 4 corners. Place the bed sheet directly over the mat. Ensure that your child does not come in contact with the mat. The mat is very sensitive and sweat from the body can trigger the Chummie alarm. How do I clean the mat? My child sweats a lot what precautions to take to minimize false alarms? Some children sweat more than other children. This may cause the IntelliFlex mat to go off at night. To minimize false alarms, follow the step below. • If Place the IntelliFlex mat in a pillowcase and secure the mat on the bed by placing 4 pins in the 4 corners . • Place a bed sheet directly over the mat enclosed in the pillowcase. • To start monitoring for bedwetting events, insert the mat plug into the Chummie alarm. The alarm unit will beep twice signaling a successful connection has been established. Where can I order another replacement mat? 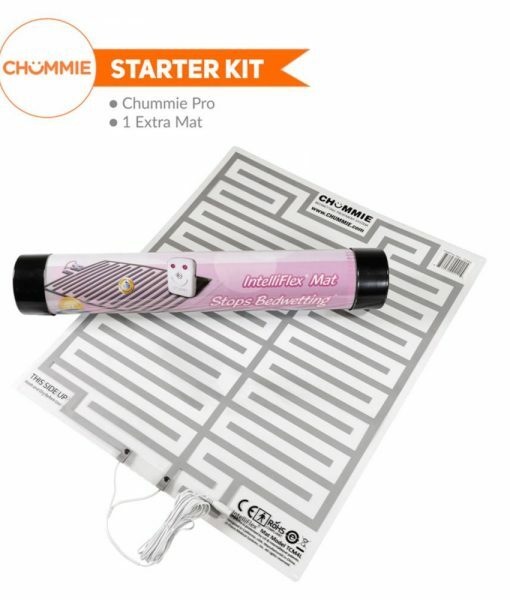 You can purchase additional IntelliFlex Mats for the Chummie Pro Bedside Bedwetting Alarm here . You can contact us at (800) 230-6775 if you prefer to order over the phone. How to store Chummie pro alarm in the day when not in use? For daytime storage, disconnect the IntelliFlex mat from the Chummie bedwetting alarm unit. The alarm unit beeps once and enters standby (power save) mode. Do I have to cover intelliFlex mat with any bed sheet before using? The Chummie Alarm and IntelliFlex mat are very sensitive and sweat from the body can trigger the alarm. Make sure that that skin does not come in contact with the mat. It is always recommended to first place the mat in a pillow case and then put it under a bedsheet. How to clean the bedside bed mat in the night for immediate reuse? Wipe the IntellIFlex mat with a damp cloth and then clean dry. Do NOT place under water or submerge in water. How Should I use waterproof overlays with Pro Mat? It’s a good idea to use waterproof overlays. These will protect the mattress from urine stains. However, the mat should always be placed on top of the waterproof bedding. 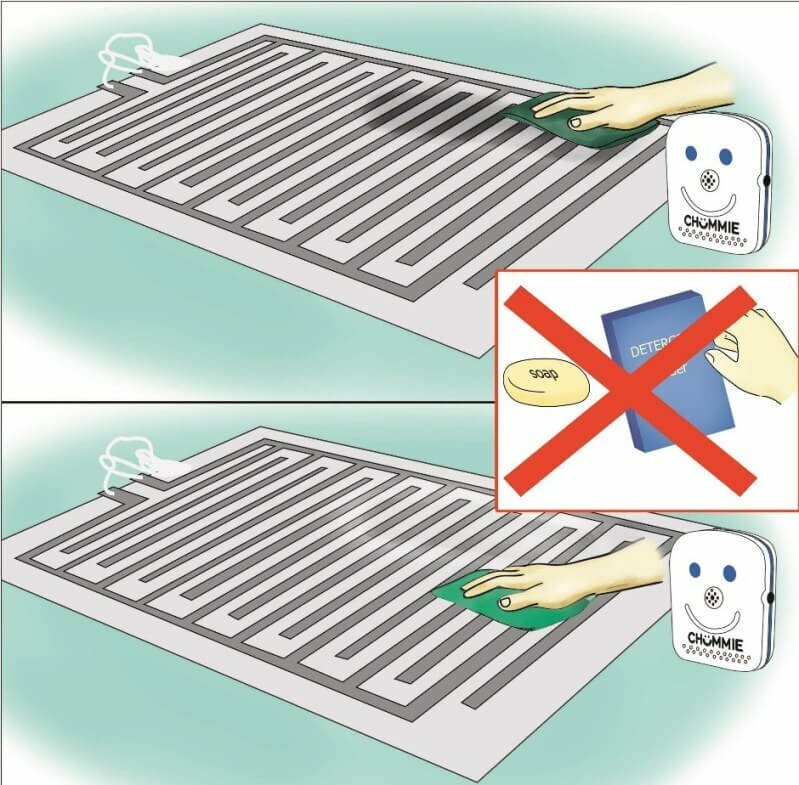 Never place the mat below the waterproof bedding or else the alarm will not detect any urine. Can I use the same mat for my second child? For hygienic purposes, it is always recommended that you use a new mat for each mat child to be treated. The mat comes in contact with urine so it is advisable to use a separate mat for each child. Additional mats can be purchased here. 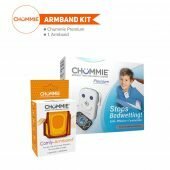 At the Chummie Store, shop for wearable and bedside bedwetting alarms to stop nighttime bedwetting in children, teens and adult bed wetting. Doctors often recommend Chummie alarms as the first line of treatment for primary nocturnal enuresis. Award winning Chummie alarms are the Best Bedwetting Alarm and Enuresis Alarms to stop bedwetting. Chummie's patented technology helps wake you up as soon as urine is detected for a fast and effective treatment. The Chummie Store is your One Stop Bedwetting destination. © 2019 Chummie Bedwetting Alarm. All rights reserved.